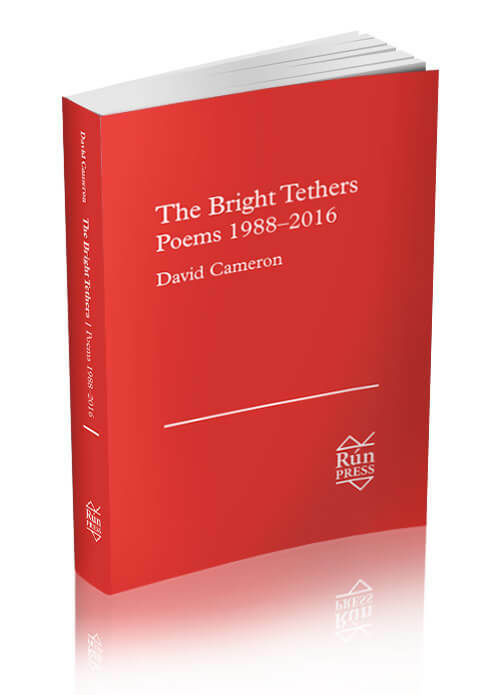 Four decades of poem-writing have gone into the making of The Bright Tethers. This is the best of Cameron, whose achievement is steadily gaining recognition (his poem ‘Night Singing’ is read in Irish schools; in 2014 he received the Hennessy Literary Award for Poetry). David writes only about what springs at the throat. His themes may be the big ones of love and death, but the details are those of ordinary life. The earliest influences have been the deepest: Donne, Blake and Hardy; Edward Thomas, the early Eliot, Rosenberg, Graves and Riding. Some of the book’s poems were published in periodicals and anthologies, but mostly they have circulated among fellow poets. One of these, Seamus Heaney, has written appreciatively of the poetry’s ‘strangeness and credibility’. As well as the odd boy. I daily ached to touch. For one among them there. Your father’s. Just that. Remember. And why is it round the wrong way? Who’s afraid of a dog daisy. The milk-white music box has stopped. Smiles as I take a cigarette. I get to touch each moulded pouch. The key; if I should come or go. Is this the door that’s just for show? In Mrs Robinson’s living room. The blindfold up a bit. And dark to see the light displays of cars. Those mushroom-gatherers on that gleaming hill. And claim they saw it all or had it whole. I looked for God. I found a barber’s pole. To make the children understand. You know it too. You used to do. Him hidden, waiting to be kind. It’s no life, not for you. I see that now. You’ve seen I would not wish on any daughter. Forgive me. I forgot how young you were. You hear your voice, and in it something wild. Can tell you in this place of simple rhyme. The child’s asleep, and has been for some time. You’re only singing now to soothe yourself. – To this hall-hovering, snooty frown. Their fake-gilt frames upon the wall. A bed made for the two of us. David’s lyric ‘Black-eyed Susan’ was recorded by Morton Valence’s Anne Gilpin and Robert ‘Hacker’ Jesset (who set the lyric to music), in their one-off project Black Angel Drifter.